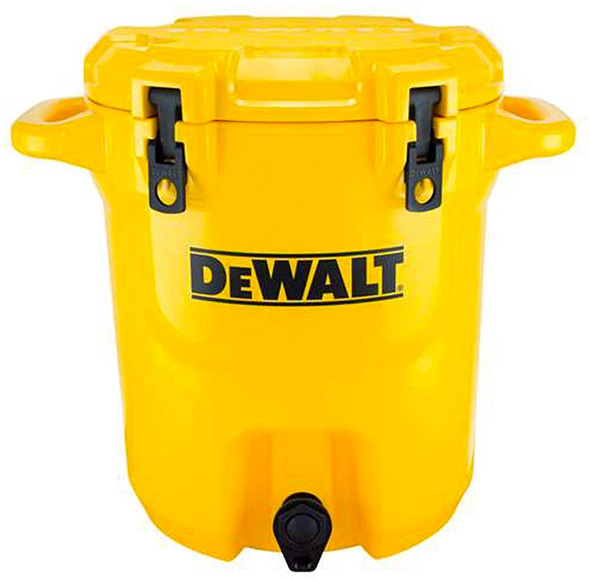 Shown here is the new Dewalt 5 gallon beverage cooler, with fixed side handles and a push-button spout. It has two easy-throw latches for keeping the lid closed and secure, and non-slip feet to help keep the cooler in place. Two recesses on the bottom give you more carrying and lifting points. How do you think it compare to popular portable 5 gallon water coolers that cost $100 less? The new Dewalt water cooler is made in the USA. I suppose if you’re a fan of the Yellow Dewalt stuff than its right up your alley but the Rubbermaid drink coolers are $30 and last forever. I don’t get it. Rich guy coolers? The Igloos, Rubbermaids & Gotts have been more than useful & durable for decades. It’s always been a mark of a real field guy to hoist a 5-gallon model over your head and getting the cold water directly without bobbling the thing. For someone with a $150 cooler, maybe a waiter? The whole Yeti thing is silly, and I find myself losing respect for those who casually mention their “Yeti tumbler with [favorite bourbon] in it” like they’re really accomplishing something there. I would replace my Rubbermaid one with thus dewalt one if thus one was $50. $150 isn’t going to work for me. “Keeps drinks cold extra long!” Also known as heavier, bulkier, holds less. Thanks but no thanks. Waste of money. I’ve got a Yeti tumbler, it was a give away at a party. I used it for a water glass but it didn’t really hold enough to satisfy the middle of the night water need. Swapped it out for some cheap stainless novelty cup (another party giveaway). I’m way happier with the cheap single wall cup. Holds more water. If this was going to be an extra heavy duty bucket would be more DeWALT thing. I occasionally see trucks with coolers mounted to the back, but it’s more landscapers and tree service trucks. They’re at some jobsites too, but for larger groups and not 2-3 workers. out west in central CA, where this last year we had over 30 days straight over 100 degrees in the summer. damn near every work truck i went past had a cooler on it – regardless of the industry. even now, in winter, we see them still. Yep, gotta remember folks work in all different climates… here in the high desert we hit 120+ in summer and EVERY work truck has an orange igloo on the back corner. You’d literally die if you didn’t have water on site. I would die for a summer like that. But here in England we almost don’t get summer I would say. I’m high desert, too. Love them dry -15 winter’s and 120 summers lol water on and in every truck is absolutely necessity, I’ll grab 2 cases of bottles every time I’m in the shop. We had orange and white Rubbermaids – or maybe some Gotts. Fine for some jobsites. For $22 you can advertise for HD instead of Dewalt and save yourself $138. I saw that, but decided to save it for another post about Rubbermaid and Igloo coolers. Thanks for the link, Fred! I’d be sold at $30 tops on this. Or even $10. Canadian dollars here, not US Dollars. 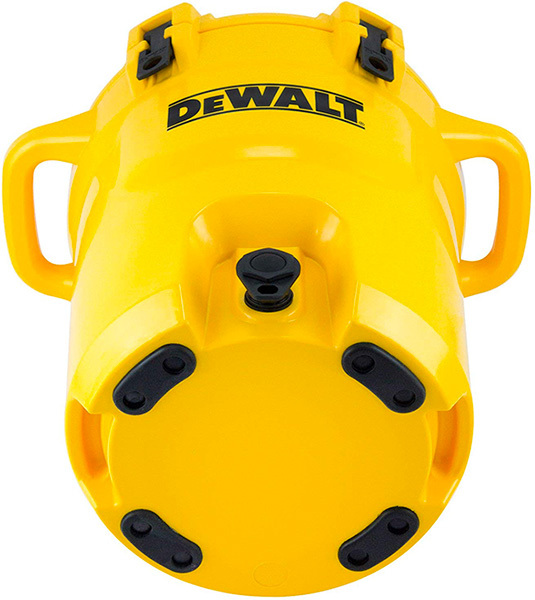 I saw this on Facebook a few minutes ago, and I came into this hoping it was a SERIOUS cooler offering from DeWALT, designed for construction sites to double as ice cooler for bottles of water/gatorade/hydration drinks (not alcoholic) and the spout was for draining the melt to clean hands to check for cuts or whatever first-aid purposes. And for THAT? I’d expect more Tough System Rails and/or TSTAK clip on areas, NOT more grab and carry points. Even if it DID have the serious rack systems involved, I wouldn’t go up to $200 CAD for this. 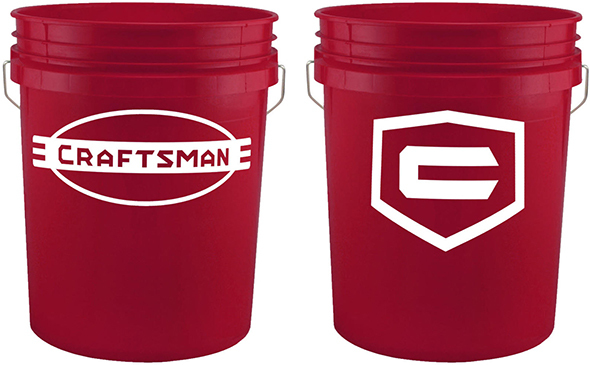 I can get 20 Coleman 50 L coolers with drains built in for $200. I’m not paying that for A BUCKET. I’m a MAJOR DeWALT fan, and even I find this insulting to the consumer! i have cheap and expensive coolers and drink cups. some are yeti and some are not. they all offer different things at different price points. sometimes one is better suited to the task or situation than the other. there is no doubt that premium priced products are better made and often perform better. on the flip side it is not wise top leave your yeti cooler sitting unattended in the back of your truck and it is painful to forget where you left your yeti cup. i rarely see anyone offended or worked up about a premium priced tool whether it be a framing hammer, wrench, power tool or vehicle. just because you don’t feel or see the need for an expensive water cooler, someone else may. 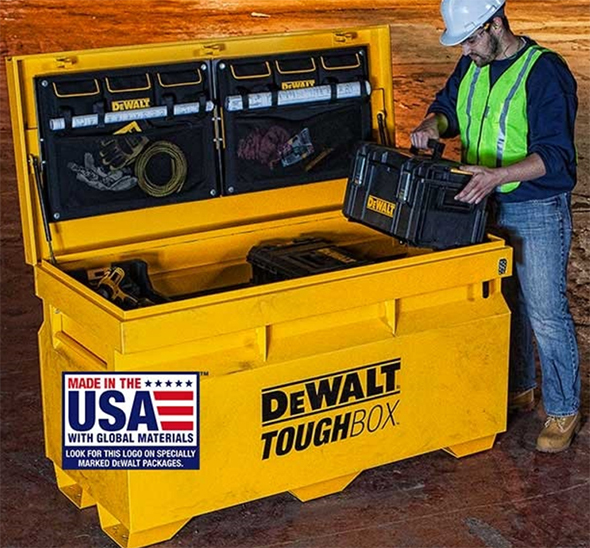 I’m in…first, coolers are a must have on jobsites ( framers,roofers,sidewallers, construction) …we have the Home Depot version for all the trucks. ..but I’ll get this for the dewalt truck…I’d buy a Milwaukee and Makita one too if they make one. …our supervisors and myself ,have Poland springs bottled water in a cooler. ….as for price, it’s all relative. Why buy Matco when there is HF..why buy PB Swiss hex long handle color coded ball end when husky makes them…why buy a BMW when a Kia will do…. …it only makes sense if you like it. One other thing , you’d be surprised at the level of loyalty, pride,the guys have for their tool brand at work.keepimg the crews happy translates into working harder, longer and producing more revenue. …so buying this is just another investment in our crews. …What Voodoo did you just write down? Why the (Insert Profanity Here) do I now WANT one, when I JUST convinced myself, only 2 posts up, that this didn’t have the features of a $200 Cooler? …What did you just do to me? …Seriously, how’d you do that? Im not a tech guy,don’t know how they work , just know ,what does work the best…mad props. Actually, I just have a freak IQ. I get bored easily, therefore, I study multiple fields until I’m an encyclopedia on it. And when it comes to accumulating skills, I learn extremely quickly, and am ashamed of the fact that I have yet to find a skill I can’t master easily. The only exception is athleticism, especially height-oriented skills. I am of the short, stocky type. To say I’m an expert in any one field is to admit to cheating. I have huge problems with social situations, balancing that “Bonus” ability out. Retailers aren’t going to stock them if they don’t expect to sell them. Similar to their lunchboxes that came with a drill/impact kit at Lowes a few months ago. A few people I know that have just about have DW tattooed on their err… arm, really wanted those, even at the crazy price they were going for on eBay. So with that, I’d say for whatever twisted psychological reason it is, Joe Framer is right with increasing a teams productivity. If I was on the crew, I think I’d be more productive if we recieved 3 of the HomeDepot ones, and the money saved going to powered mix for 2 of them. Have no fear, there are some Gatorade bottles for very hot days as water alone doesn’t replenish enough of what the body needs…. Adding a powder mix is not what they want , because they pour the cold water over their heads also..
..which of course leads me to buy coolers that retain the coldness of the water the best., It does matter, to them if it’s cold. As for someone saying they wouldn’t drink from a cooler,well it’s clean water from gallon jugs , usually whatever is on sale,which is far better then filling it with a hose….but you would drink anything if you worked in the trades, outside,for a living. ..I just spoil my crews because I was a crew guy for years before being management.They appreciate it and I appreciate their work effort. I bought one of the Dewalt toolbox coolers this year for <$90 shipped. I have been pretty pleased with it so far. It has been holding ice as advertised and I can connect it together with my other tool boxes to keep things neat and tidy in the truck bed. However, I don't think I would buy this water cooler as the main selling feature, connectivity to my other tool boxes for ease of storage, is not present. That tough system cooler works well, I agree..and stackable. So… the price… It’s free advertising for DeWalt so this decision to make an expensive and high quality ice cooler, instead of a cheap one made for the masses, doesn’t make much sense to me. Maybe they don’t want to just get their name out at the cost of a bad item, but if I found a DeWalt branded igloo in the store for a few bucks more, I’d buy it, and would never complain it wasn’t a Yeti. Disclaimer: I grew up with all Mexican/Salvadorean friends in SoCal, speak Spanish fluently and lived with a Mexican family for 1/2 a year, so no, my comments are not racist, just observations. Doesn’t sound racist, sounds like you’re speaking up for a specific demographic. You’ve made it pretty clear that southern workers prefer cheaper or ad-hoc solutions to the expensive branded ones. That’s a Demographic, not a Racial anything. You have experience in and around them as an objective observer. That rules out Racism. My theory in life: Don’t apologize when you haven’t done anything wrong. Makes sense. 1 liter per hour is recommended for outdoor activities, x 8 hour work shift. Are they rotomolded? If so they’ll be more durable than regular coolers. Whether that matters is an individual decision. I tend to be hard on things. Especially when I’m having a bad day. I would buy this if it came with a Milwaukee Fuel tool set inside the cooler. Now that would be marketing: every cooler comes with a burnt out/broken FUEL tool at the bottom of it! But for my job sites it’s easier to just buy some ice chests and cases of bottled water than to deal with a water jug and keeping it clean. Ha Ha Ha! An early April fools day joke, maybe? US$150 is just plain insulting to our intelligence. Probably made in their Thailand factory for US$2 or 3 each. When working in the orchard we have a number of 2 & 3 gallon coolers for drinking water. The reason we have many is they are given away at the chemical and fertilizer stores when you buy a reasonable amount of product. And given at the Vehicle Inspection Stations (when paying inspection & annual vehicle tax). The VIS is where you can buy vehicle insurance at the best rate.